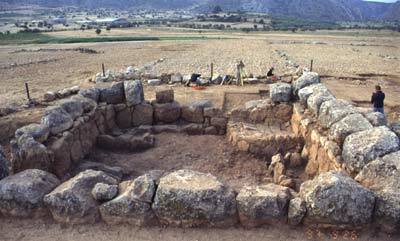 In 1934 Axel W. Persson initiated his archaeological investigations in the Berbati Valley east of Mycenae. In the ensuing years he worked in the valley together with among others: Åke Åkerström, Gösta Säflund and Erik J. Holmberg. Each of them had his own excavation: Säflund the south slope of the Mastos Hill and the Western Necropolis, Holmberg a chamber tomb to the east and Åkerström the Potter’s Quarter. Åkerström continued working in that area after the War. The investigations in the 1930’s were concentrated in the western part of the valley, where Orestes from Mycenae, who had worked with Persson at Dendra, had pointed out the most promising site: that on the eastern slope of the Mastos Hill (i.e. the Potter’s Quarter). In 1935 Persson excavated the tholos tomb, which contained one burial. The Palace style and other pottery associated with it date the tomb to the LH II period or c. 1400 BC. Pottery of Late Geometric (late 8th century BC) and Late Roman date attest the fact that the tholos tomb was reused in later periods. The tholos tomb was published by Barbro Santillo Frizell in Opuscula Atheniensia 15, 1984. The chamber tombs were published much later by Säflund (1965) and Holmberg (1983). The most interesting excavations were the ones on the Mastos Hill, where Säflund and Åkerström investigated each his settlement area: Säflund the Early Helladic (c. 2600-2000 BC) one on the south slope and Åkerström the Late Helladic (c. 1600-1200 BC) on the east slope. Säflund published his results (together with the chamber tombs in the Western Necropolis) in 1965 in the Stockholm University Studies, while Åkerström resumed work at the Mastos in 1953 and finished fieldwork in 1959. He published the pictorial pottery in the institute series in 1987. The large amounts of pottery that remain are now under study by Mats Johnson (Neolithic), Jeannette Forsén (Early Helladic), Michael Lindblom (Middle Helladic), Ann-Louise Schallin (Mycenaean) and Jenni Hjohlman (Medieval). The most spectacular structure in the Potter’s Quarter is the kiln, which Åkerström dated stratigraphically to the transition LH II/LH IIIA1 or c. 1400 BC. He found a dump south of the kiln with pottery supporting the date. Production continued at the site and dumped material east of the kiln testifies to hundreds of years of pottery making. Åkerström maintained that Berbati was the production center of the spectacular pictorial vases found on Cyprus and in the Levant. Not everybody has accepted his theory but most scholars now seem to agree that the northeast Peloponnese was the origin of these prestigious vessels. 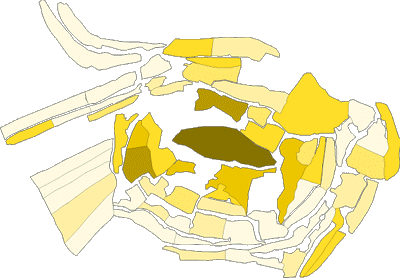 Analyses of the fabrics have shown that the clays are consistent with the clays in the general Berbati/Mycenae area. Schallin’s research into the Berbati production aims at studying the relationship of shape and decoration in the local Mycenaean repertoir employing statistical methods. In the late 1980’s Berit Wells initiated fieldwork on a large scale. A surface survey of the valley and of the mountainous area to the east around Limnes was carried out. The scope of the survey was to study the interaction of man and environment through time, from the Middle Palaeolithic 50,000 years ago until the 18th century AD. The publication, which appeared in 1996 in the institute series, changed the hitherto accepted view of the Berbati valley as an archaeological entity. The previous Bronze Age finds now could be put into a historical framework. Before the survey we knew nothing, or next to nothing, about the Neolithic (5th-4th mill. BC), the Early Hellenistic (3rd century BC) and the Late Roman (4-6th century AD) periods in the valley. Now we know that it flourished during those times. Regional and diachronic studies became almost the rule in Greece during the last two decades of the last century, but The Berbati-Limnes Survey is one of the few that has been completely published so far. From 1994 onwards several sites documented during the survey were investigated or underwent further documentation. These sites were included in a larger research project (the Berbati Valley Project) to investigate the agrarian economy of the valley. 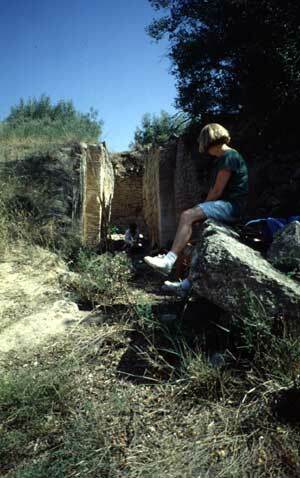 In 1994 the Late Geometric/Archaic cult place defined in the survey and associated with the tholos tomb was excavated. Gunnel Ekroth is studying the assemblage and published a preliminary report on the material in the Opuscula Atheniensia 21, 1996. The same season a study of the Late Roman bath was carried out, also reported on in the same Opuscula. Kai Holmgren did a CAD model of the extant structure within the framework of a project designed jointly by the departments of Archaeology at Lund University: Swedish Prehistory, Medieval Archaeology and Classical Archaeology and the Swedish Institute at Athens. From 1995 onwards the project focused entirely on the agrarian economy of the valley. Although several targets had been chosen for excavation, only one at Pyrgouthi or the Hellenistic Tower could be realized. It turned out to represent a spectrum of chronological phases contrary to what the survey had shown: from the early Iron Age to the 6th century AD. Penttinen (diss. 2001) redefines the Berbati Valley as a typical border region, which sometimes is dominated by Corinth, sometimes by Argos. Most of the material comes from disturbed contexts, which, however, reflects migrant animal husbandry rather than sedentary agriculture thus defining a border zone. The most spectacular finds at Pyrgouthi date from the 6th century AD (Hjohlman diss. 2002). A farmstead with its press-house was destroyed in a conflagration. Whatever was in the press-house at the time was buried under the debris, presenting a frozen moment in the history of the site. 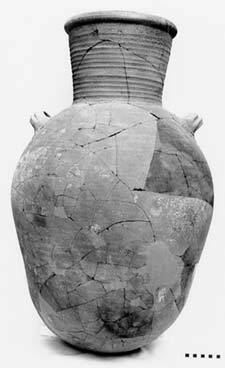 Large storage jars, which could be mended, wine presses and agricultural tools were found. Kilns datable to the 5th century BC were found also at Pyrgouthi. At present we have a substantial amount of evidence of ceramic production in the valley with all in all four production sites: the previously well-known Early Mycenaean kiln from the Mastos Hill, the 5th century Pyrgouthi kilns, a Late Roman kiln found by our Greek colleagues west of the Roman bath, and the waste from a kiln built for the production of roof tiles after the German destruction of the village of Berbati in 1943. Obviously the manufacture of ceramics was a by-product of the agrarian economy during several periods of the history of the valley. Berit Wells together with Ian Whitbread and Matthew Ponting of the Fitch Laboratory at the British School at Athens are doing a comprehensive study of the Berbati clay beds and ceramics through time. Undoubtedly ceramic production was an added asset for people living in the valley. See Arto Penttinen, Berbati between Argos and Corinth (diss. University of Stockholm, Department of Classical Archaeology and Ancient History), 2001 and Jenni Hjohlman, Farming the land in Late Antiquity. The case of Berbati in the northeastern Peloponnese (diss. Stockholm University, Department of Classical Archaeology and Ancient History), 2002. These dissertations together with a number of specialist reports on botanical and faunal remains etc will be published in the institute series in early 2005. The Berbati Valley Project was brought to conclusion in 1999 with an intensive survey of the Mastos Hill, which had been excluded from our permit for the 1988-1990 survey. The aim of the 1999 survey was to test new methods of field sampling and digital processing of data. Terrace by terrace all artifacts were collected and analyzed in the field. Small samples were collected for further study in the laboratory. The artifact database was related to a digitized model of the hill creating distribution maps to illustrate artifact density on each terrace and thus activity on each terrace period by period. In this way we have gathered new information on the history of the hill. So far our knowledge of the medieval period was very scant. It is now obvious from the distribution map below that a small medieval habitation must be sought on the top of the Mastos Hill. The investigations in the Berbati Valley during the 1980’s and 1990’s have not produced artifacts comparable to the old excavations at Asine and Dendra. The objectives have been different. The importance of the investigations for Swedish Classical Archaeology lies in the fact that new methods have been tested and young scholars have been entrusted with the publication of material, sometimes for their dissertations, which has ensured quick publication. Therefore Berbati also became a training ground for a whole new generation of archaeologists. In this respect it can be compared only to Asine in the 1920’s and Acquarossa in Italy in the 1960’s and 1970’s.